Although Welltris was the official sequel to Tetris, Blockout seems like more of a logical extension of the classic puzzle game. Blockout features a top-down view of a 3D well. 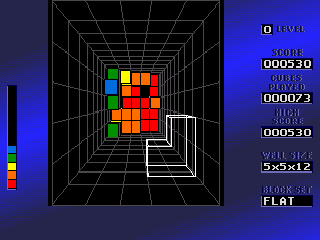 As with Tetris, Blockout pieces are made up of smaller cubes, and the object of the game is to clear completed levels made up of these cubes. The sides of the well are marked and each level of cubes has its own color, making it easier to determine which level each cube is in. The game has three standard game modes, each of which use their own block sets and well dimensions. The easiest, “Flat Fun” uses a 5x5x12 well and flat pieces. “3D Mania” uses a set of 3D blocks and a smaller well. Finally, “Out of Control” mode uses the “extended” block set, which is a 3D set made up of more complicated, chiral 3D pieces. You can also set up a custom game, setting the well depth anywhere from 3 to 12 cubes, setting the well floor to a width and height of anywhere from 3 to 7 cubes on each side, and you can choose any of the three block sets. The flat block set more closely resembles the tetronimos in Tetris, the basic set is a 3 dimensional extension of the flat set, and the extended set is a 3D set made up of more complicated shapes that I found a bit too complicated to be much fun. Blockout has a steep learning curve as you have to learn to use all three buttons on the Genesis controller to rotate your pieces in three dimensional space, as well as the start button to drop your current piece to the bottom of the well. The game has simple but colorful graphics that do little to take advantage of the Genesis’ capabilities but that present the game well. There is no background music during gameplay, and the music that plays at other times sounds like a something that EA might have borrowed from one of their sports titles. Still, puzzle games aren’t played for their razzle-dazzle graphics and unique music, and what Blockout does it does well. This is a game that should appeal to any Tetris fans looking for something that offers a new angle on the classic formula. Buy Blockout on GameGavel or Amazon. Tagged Blockout, genesis, Puzzle, Review, sega. Bookmark the permalink.